A .MKV file is a Matroska video/audio multimedia file. It is a container like MOV and AVI, providing support for a huge number of different video, audio and subtitles compression formats. Its popularity is partly due to the incredible support for several subtitle formats including SRT, SSA and USF text subtitles, or VobSub streams coming directly from the DVD. Downloaded a file with the extension MKV, but can't get it to play whatever you do? Don't worry. Here you can quickly find the solution. Wanna import MKV files for editing or burning, but your video editor or DVD burner don't let you do it? Here we will provide useful tips to help you solve the problem. How to work with MKV files in DaVinci Resolve smoothly? 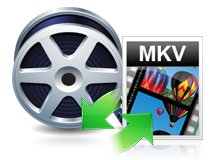 MKV is not that widely used as MP4, thus you may find it's hard to enjoy it on the go. So here we list all the applications, website and devices that are compatible with MKV.